Look at the adorable invite I just stumbled into during my daily discovery time. 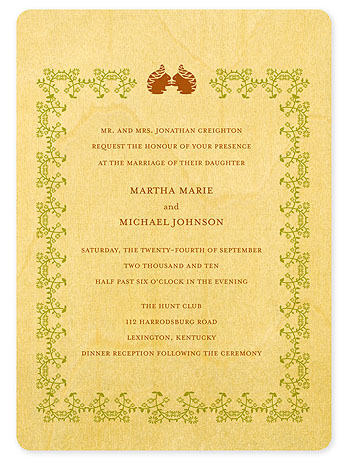 Birch wood invitations, reply and save the date cards from Night Owl Paper Goods- modern yet folksy. They call them eco-chic wooden goodies and list three retail spots right here in Wisconsin. Hmmm, I would reuse the reply card as a place card on my reception tables. Such tactile delights to send out to loved ones. Just had another idea, stick a magnet on the back and your invite becomes duel eco-chic refrigerator art/reminder. Of course I am drawn to the design graced with the adorable squirrels at the top. I just love that pistachio green! I think I just saw our youngest garden squirrel nodding his head in agreement. It must be that extra cup of morning coffee that makes communication with the squirrels seem so easy. This was written by admin. Posted on Friday, June 12, 2009, at 11:09 am. Filed under Invitations. Tagged Invitations, Squirrels. Bookmark the permalink. Follow comments here with the RSS feed. Post a comment or leave a trackback.